I have a fascination for the history of Phoenix, Arizona. It's been a hobby of mine for many years to collect old photos, maps, that sort of thing. I read old newspapers and do what I call “time traveling”. I like to imagine what Phoenix looked like in the past. And since I live in the 21st Century, I am often amused by people who wondered why something was built “way out there”, which we now think about as being fairly nearby. And then I look around and realize that it's happening all of the time, and people are still saying the same thing. I call this “history in the making”. I could call it “why are they building something out in the middle of nowhere?” I guess. And it makes sense. One of the areas that I have been watching since the early 90s is the valley that is just west of the White Tank Mountains. 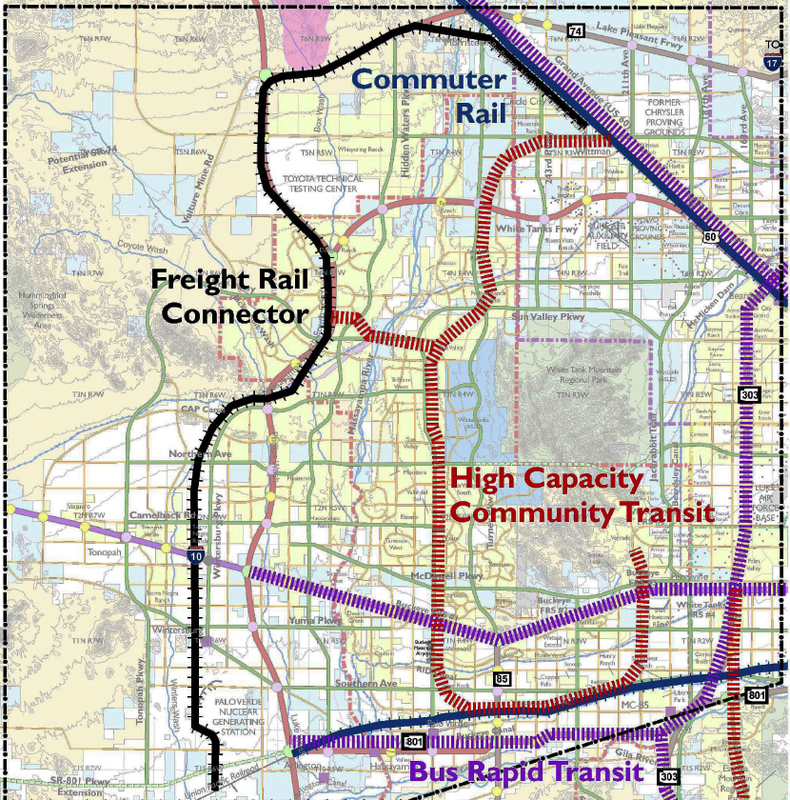 If you live in the Phoenix area, you may be wondering who would be crazy enough to build something way out there. But it started in the 1980s when a 4-lane privately-funded road was built there, called the Sun Valley Parkway. When I tell most people about this, they insist that no such thing exists. 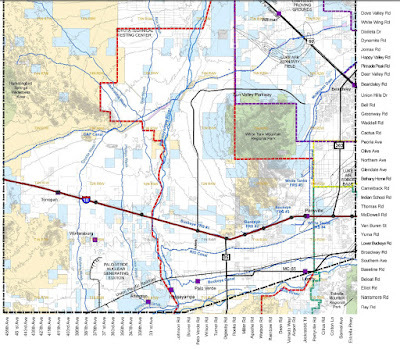 If I mention the Hassayampa River, they can usually only imagine it up by Wickenburg. But it flows south, through an enormous empty valley just west of the Salt River Valley. 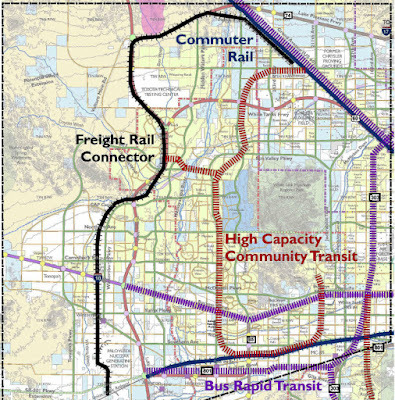 The edges of this valley have seen some development, the northern edge has some retirement communities spilling over from the Sun City area, and to the south there are some developments near the I-10 freeway. But in-between, for miles and miles, it's empty. It's a popular place for motorcyclists, who just want to see the desert and feel the wind in their hair, but for most people it's just way out in the middle of nowhere. If you drive it, be prepared for a feeling of “wow, this is interesting” followed by a long feeling of “wow, this is boring”. The Sun Valley Parkway goes from I-10 north and loops around the northern edge of the White Tank Mountains, where it joins up with Bell Road. That's a considerable distance of emptiness. Of course, when the Sun Valley is all built up, people in the future will wonder why the people back then ever thought that it was “way out in the middle of nowhere”. And if you're reading this before it was built, you will be able to say that you remember it, back when you were young, when it was nothing but miles and miles of open land, just like Phoenix used to be. 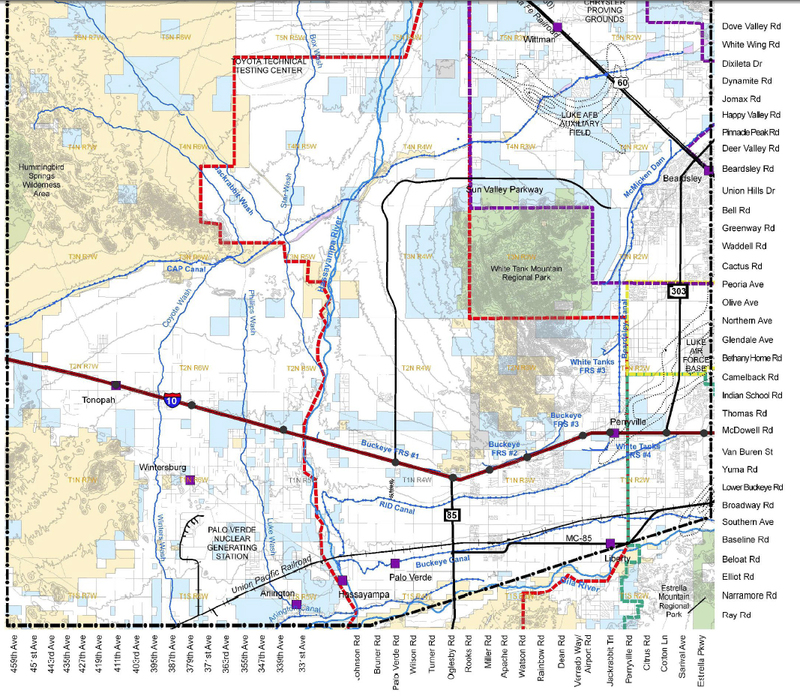 Image at the top of this post: plans for the Hassayampa Valley (Sun Valley) from 2007.